Send us an email (jc@striv.tv) if you are interested in upgrading to the Plus version. Over the summer, Christian and I worked together to create a new and improved scoreboard app. In the process of creating the scoreboard app, we had three goals: simple usability, more hotkeys and help share your schools story faster. We are excited to announce that every school can use the new scoreboard app today! In this article, I will explain how we met these goals and Christian will walk you through how to use the scoreboard app during your live stream. Simple usability. Creating a scoreboard that is simple to use was one goal I believe we can check off our list. With the ability to select your event and set the quarters & timeouts, you now have more time during the game to focus on your live stream! How? I will explain in a little bit. Want to change the names of the teams? No problem, just click on the team names and edit them. Want to change the scoreboard gradient? Just click on it. With everything being clickable, you will now have more space on your screen and spend less time finding where that feature is at. With simple comes usability and with usability comes more hotkeys! More hotkeys. This is a feature I’m pumped about, if you can’t tell. 🙂 Hotkeys can be a make or brake feature, depending on functionality and ease of use. 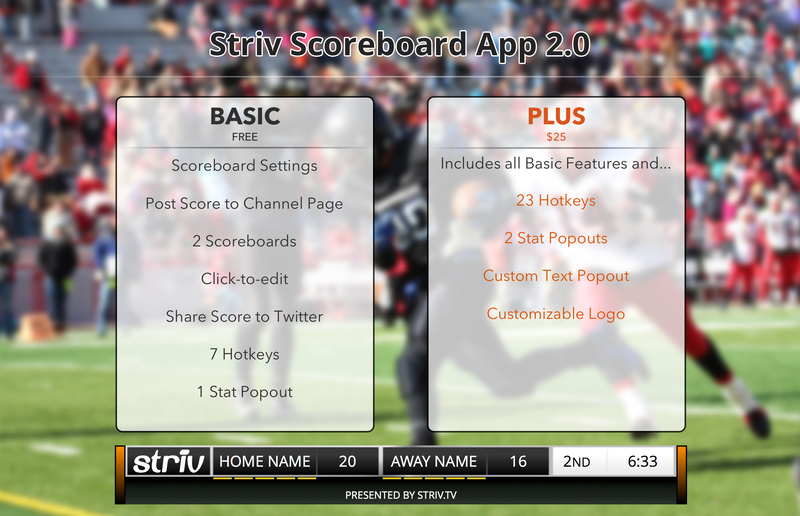 In the Striv Scoreboard App 2.0 we added more hotkeys in the plus version to free up more time. The great thing about the hotkeys is your hands can rest in one spot because the shift and arrow keys are all you need for your right hand. On an Apple computer your left hand can rest on command and tab. If you are using replays in the new Wirecast Pro, “r” is the hotkey to collect a replay which can be pressed with your left pointer finger. For a visual, watch the tutorials where Christian will show you the hand set-up. As always one of our main goals at Striv is to help share your school’s story. So for this project we added a quicker way to post scores to social media. When using the scoreboard you will receive messages every quarter asking you if you want to post to Twitter. This post has auto-generated text to speed up posting to Twitter, but you can customize if needed. The second way we are helping share your story is by giving you the ability to post the score to your channel page at the end of the game. This will give your audience the option to look at the season scores. That is just a few ways I believe we have completed our goals for this project. If you have any feedback, please feel free to use the form in the scoreboard app. Now you can watch the video tutorials by Christian to help you understand, navigate and use the scoreboard. Wait, one more thing…this is how pumped I am about the new scoreboard app! 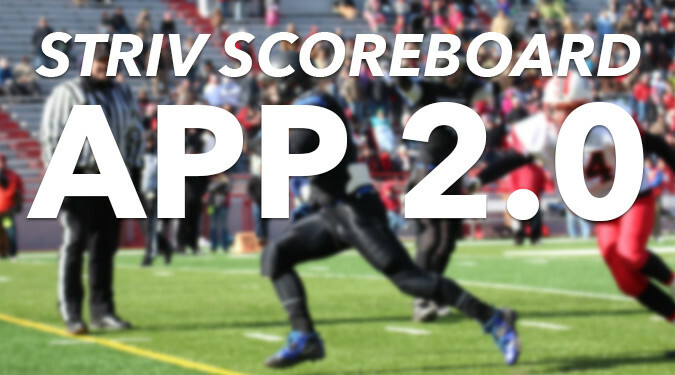 For every time you post your scores to Twitter through the scoreboard app, we will enter your school into a giveaway to win a free upgrade to the plus version! Shhhh…don’t tell Taylor because he doesn’t know. 🙂 Only one post per quarter will be accepted. Now enjoy the great videos from Christian!